1766-1855. He was baptised at St. Paul’s Parish Church, Covent Garden, London. Giffard entered the service on 25 April 1780 aboard the Canada 74, Captain Sir George Collier, serving in the Channel Fleet and at the relief of Gibraltar on 12 April 1781. On 2 May, whilst cruising in the Atlantic, the Canada captured the Spanish frigate Santa Leocadia 34. He remained aboard the Canada when Collier was succeeded by Captain Hon. William Cornwallis in the summer of 1781, with the vessel going out to North America in August. Continuing with Cornwallis aboard the Canada, Giffard was present at the Battle of St. Kitts on 25 / 26 January 1782 and at the Battle of the Saintes on 12 April. At the end of July the Canada left for England with the French prizes from that battle in convoy under the orders of Rear-Admiral Thomas Graves, and she was one of the few ships that managed to survive the Central Atlantic Hurricane on 16 September. He subsequently served aboard the Dragon 74, Commander Thomas Ley, which vessel was paid off in March 1783. During the peace Giffard was employed aboard the Portsmouth-based guardship Ardent 64, Captain Henry Harmood, and thereafter the sloop Trimmer, Commander Charles Tyler, seeing duty in the preventative service in the Bristol Channel. In February 1789 he was one of many promising young officers who sailed for India aboard the Crown 64, Captain James Cornwallis, flying the broad pennant of Commodore Hon. William Cornwallis, and he was commissioned lieutenant of the Vestal 28, Captain Sir Richard John Strachan, on 20 October 1790. He thereafter saw service on the Crown and the Minerva with Commodore Cornwallis before returning home in 1793 to recover his health. 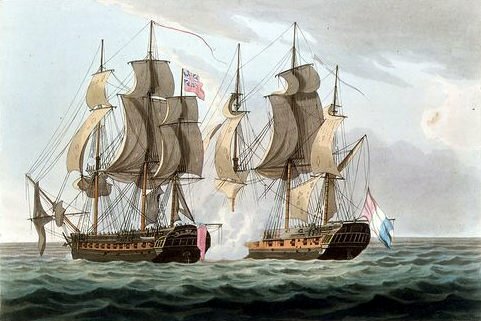 During the early stages of the French Revolutionary War Giffard was serving in the Channel aboard the Theseus 74, Captain Robert Calder, before joining Admiral Lord Howe’s flagship the Queen Charlotte 110, in which, under Captain Sir Andrew Snape Douglas, he fought at the Battle of Lorient on 23 June 1795. Having been promoted commander on 1 February 1796, Giffard commissioned the new brig Raven 18 in which he departed St. Helens on 11 August with Vice-Admiral Sir Hyde Parker’s grand convoy. Whilst Parker diverted to the West Indies the Raven escorted the Portuguese element of the convoy into Lisbon, and she then sailed for the Mediterranean where Giffard appraised the commander-in-chief, Admiral Sir John Jervis, of Rear-Admiral Robert Man’s close encounter with the Spanish fleet off Gibraltar. He was posted captain into the frigate Mignonne 32 on 19 October 1796 by Jervis, and in early 1797 commissioned the Spanish prize Mahonesa 36 for service in the Mediterranean, with which vessel he assisted the Romulus 36, Captain George Johnstone Hope, in the capture of the Spanish brig Nuestra Senora del Rosario off Cadiz on 24 May. Sailing for England, the Mahonesa was paid off at Plymouth in June 1798, and she was then broken up. On 23 September 1800 Giffard assumed the temporary command of the Active 38 for Captain Charles Sydney Davers, serving off Cherbourg and capturing the Quinola 14 on 26 January 1801, which privateer had come out of Morlaix the day before. Davers returned to duty in February, and towards the end of the month, acting for Captain James Newman Newman, Giffard took the Loire 44 out from Portsmouth on a cruise. In March it was gazetted that he had been appointed to both the Hussar 38 and the Magnificent 74, but it appears that he resumed the command of the Active, for in April he took her on a cruise from Portsmouth, and then in May carried troops and specie out to Egypt. In the autumn of 1801 Giffard finally assumed the command of the Magnificent, in which he sailed from Torbay for the Leeward Islands in early March 1802 with Commodore Hon. Robert Stopford’s squadron of six sail of the line. During April the Magnificent came under fire in Prince Rupert’s Bay, Dominica where a mutiny had broken out in the 8th West India Regiment, which was then garrisoned at Fort Shirley. Giffard was able to help bring order after going ashore, although it was still necessary for his ship to open fire on those mutineers who refused to submit. Shortly afterwards the Magnificent sailed for England, and she was paid off at Portsmouth towards the end of August. During April – May 1803 he fitted out the Prince of Wales 98 at Portsmouth for the flag of Rear-Admiral Sir Robert Calder, and from June he commanded the Dryad 36, in which he sailed that autumn to serve in Irish waters, giving passage to the commander-in-chief, Admiral Lord Gardner. Unfortunately he was obliged to resign his command at the end of the year through ill-health. Upon returning to duty he had the Athenian 64 from October 1805, in which orders to sail for the East Indies were countermanded so that he could ferry stores out to the post-Battle of Trafalgar Mediterranean fleet. He saw further employment at the unsuccessful defence of Gaeta against Marshal André Masséna’s French advance, and his final command, for a few months until curtailed by poor health, was the Zealous 74 from September 1806 off Cadiz. On 23 March 1807 Giffard became the lieutenant-governor of the Royal Naval College at Portsmouth, which position he retained until he was advanced to flag rank on 12 August 1819. He was further promoted vice-admiral on 22 July 1830, and admiral on 23 November 1841, and he was placed on the retired list on 1 July 1851. Admiral Giffard died at his residence in Carlton Crescent, Southampton, on 25 September 1855. At Portsmouth on 20 November 1802 he married Susanna Carter, the daughter of Sir John Carter, who served several terms as the mayor of that city, and who was the sister of John Bonham-Carter, the M.P for Portsmouth from 1816-38. They had eight or nine children, of whom Captain Henry Wells Giffard died in action aboard the steamer Tiger off Odessa during the Crimean War in 1854. His residence was given as Wallington, Fareham, Hampshire. Giffard was regarded as the leader of the Whig party in Southampton, and he was named by the naval historian, Captain Edward Pelham Brenton, as his oldest and most esteemed friend.